Happy New Year • If I can be bothered! As is well known I HATE New Year (there is champagne cooling but I may just be early to bed this year) and I am not fond of January either — so forgive me if I hibernate a while and come back when February lights our pretty way to spring. I am a bit behind with things anyway and I really am determined to catch up and to submit more poems and write more stories this year — so I may revise my blogging a bit! Today I noticed our first snowdrop is up and that cheered me so I welcomed it — Hello Sweetie, I said. I am determined to go for a walk somewhere in woodlands and find more! It’s a good read. I know. I chose the poems!! Our next submissions window is on February 1st – 14th and that’ll be Valentine’s Day. Look out for me in Fine Linen this January and don’t forget that Gyroscope Review opening for business on Jan 5th! It is headed by the excellent Every Day Poet’s team (except for me). So it’s going to be G R E A T ! and don’t forget to read some of my stuff from my headings and send something to those magazines — they are all great places to be and the links on those heading pages take you directly there: eg PostcardPoems&Prose I just had three more accepted there! So there’s lots to see here without me faffing on. Browse, browse and browse again! Hey Oonah! Happy New Year, even though it’s not your favorite day. 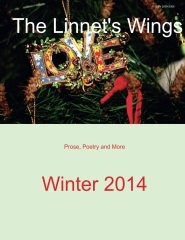 I ordered my print copies of Linnet’s Wings yesterday; can’t wait!